Hello, I’m Lil Stevens and I have just joined the GCG committee as a co-opted member. I’m going to catalogue the group’s archives and help out where I can. 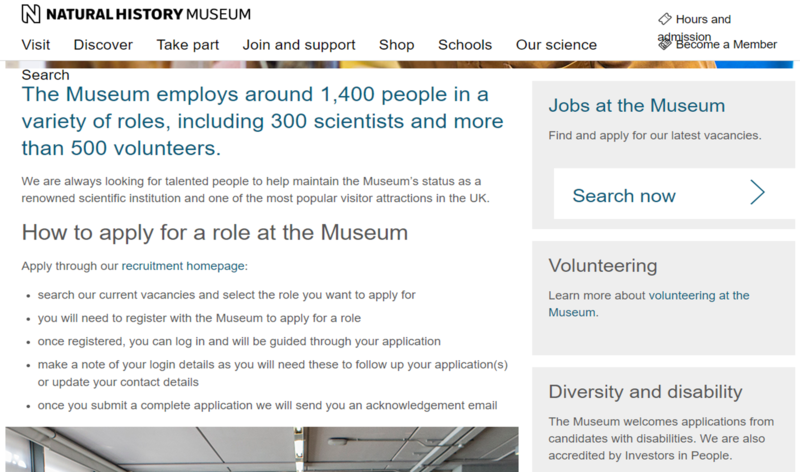 I work at the Natural History Museum in London as the Earth Sciences Collections Task Force Manager. This group was set up to provide curatorial assistance across the Earth and Life Sciences collections. I manage a (so far) small team of curatorial assistants, as well as the Loans and Exhibitions Coordinator. Doing this role has made me think a lot about what makes a good curator, especially because the role of a Task Force Assistant (TFA) is quite a difficult one. We need to be able to work in any Earth Sciences collection and know how to handle the specimens, how to structure and research the data, how and when to make decisions about the nature of the objects or documentation, what policies and procedures apply and to fit in with what the curators need us to do. Our TFAs come in at curatorial assistant level, so we’re expecting people with degrees and possibly postgraduate qualifications and asking for some experience in collections management, but the pay is pretty low. I think there is a lack of awareness in the sector as a whole about how much knowledge and experience is needed to do the most ‘basic’ curatorial jobs. A huge number of decisions are required just to take an object in to a museum and incorporate it in the collections. The representation of that object in a database is really only as good as the data it came with plus the quality of the curator who accessioned it. A typical drawer of specimens with their labels, post-curation. © Natural History Museum London. Does an applicant need to have a degree-level qualification or is that missing out on people who have relevant experience but haven’t been to university? The jury is out on this one. We think a degree shouldn’t be necessary, but it’s often hard to attain the necessary skills without one, in order to make an application shine. 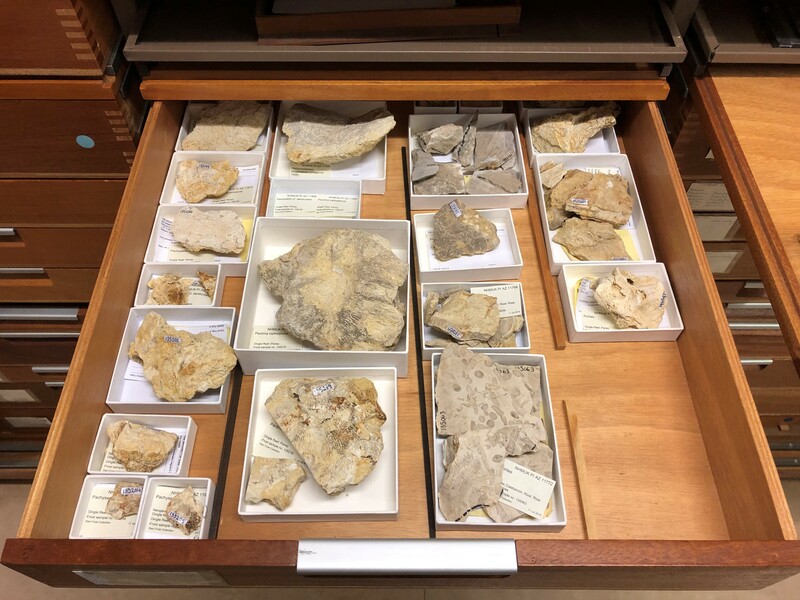 Does someone need to have a sound knowledge of anatomic, taxonomic and stratigraphic principles in order to work with palaeontological collections? We argued yes to this one, but having worked with non-palaeontologists, I can now attest that a lot of this knowledge can be picked up during the project. Of course, if you are going to be working with a particular collection and need to be able to quickly characterise it, then you will need some background knowledge. We then have a series of competencies that we’re refining so that they invite informative responses and that we hope will define what a good curator is. These include attention to detail, object handling skills, IT skills, communication and interpersonal skills and experience in team-working. Our new favourite one is ‘a pragmatic approach to problem-solving’, by which we mean, can you take on a task and manage it so that you get the most done, to a good standard, in the time available? This is a very difficult one to evidence! It’s about perception, judgement, balance, experience, team-fit, the ability to prioritise with the available evidence and to understand not just what the collections require but what your employers want. We curators tend towards the detail – that’s one of the lovely things about working with collections. However, for the good of the whole collection, sometimes it’s better to do a little for each object that a lot for one or two. Doing this while adding the value that only you, as the expert on that material, can add, is very hard to manage. So, the applications are in, and everybody writes they are enthusiastic and tick all the boxes. How do you find the ‘born curators’? Is there such a thing? Isn’t it better to have a mix of skills and approaches in a team? What are the absolute core skills? And if you are a born curator, how do you communicate that, while ticking all those boxes? Are we asking the right questions? In the end, what I look for is someone who will do the job well, in the time available. And that turns out to be a very complex ask. Whenever I do a recruitment, I always come away wishing I could take on more people, feeling inadequate in the face of all that expertise and frustrated that there are fewer and fewer opportunities to work with collections. Something that I’ve realised however, is that curators are the ultimate all-rounders. We can focus, we can manage, we can plan. We can work with both physical objects and digital data. We are strong and we are careful. We can write well and talk well. We can say yes and we can say no. We are technical and artistic. And we are extremely good at Tetris. 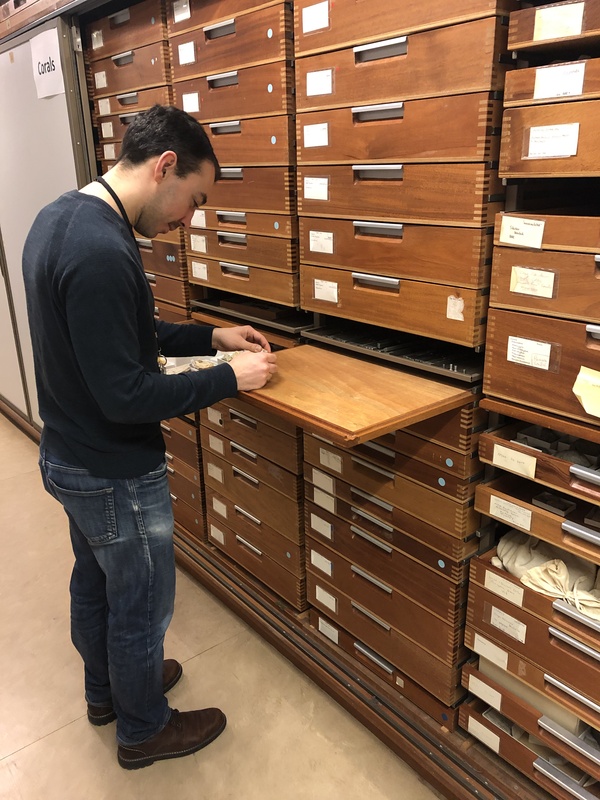 Earth Science Task Force Assistant, Matt Porter, curating the Frost Collection of fossil corals. © Natural History Museum London.